This event has been cancelled. We apologize for the inconvenience. 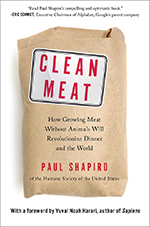 Author Paul Shapiro tells the wild story of the race to create and commercialize cleaner, safer, sustainable meat—real meat—without the animals in his book Clean Meat: How Growing Meat Without Animals Will Revolutionize Dinner and the World.. In this talk, Shapiro will detail from the entrepreneurial visionaries, to the scientists’ workshops, to the big business boardrooms, the quest for clean meat and other animal products and examines the debate raging around it. Paul Shapiro is also a TEDx speaker and the founder of Compassion Over Killing, a nonprofit animal advocacy organization centered in Washington DC. In addition, Shapiro worked for the Humane Society of the United States as vice president and spokesperson.